This volume is a first. It presents ten of the most frequently played and important tunes from the mainstream jazz genre in the signature licks format. You'll find the favorite compositions of Miles Davis, Sonny Rollins, and Duke Ellington alongside perennial standards from Jerome Kern, Erroll Garner, and Antonio Carlos Jobin interpreted by the leading exponents of jazz guitar. Every effort has been made to locate renditions of the material which contain definitive performances by the individual artists and which provide significant contrasting approaches between the various players. Accordingly, a wide selections of tunes in varied settings from duets and trios to larger ensembles is offered. There is something from every major epoch. 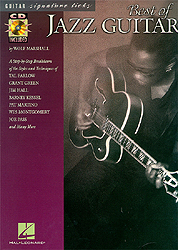 The pieces range from the genesis of jazz guitar in the swing style of Charlie Christian to the subsequent innovations of Kenny Burrell, Tal Farlow, Jim Hall, and Barney Kessell, and the hard bop and mainstream tangents of Wes Montgomery, Joe Pass, George Benson, and Pat Martino. In understanding the way in which a jazz artist approaches the core repertoire, one can glean much about the creative process at work and still more about the unique attributes of an individual and the choices an improvising musician makes during performance. That is the essence of this volume -- to present not only the actual notes played (via the note-for-note transcriptions), but to explore the paths taken by the player during the heat of the moment. Annotations provide technical analysis and performance notes shed light on the musical idiosyncrasies of each excerpt while biographical sketches underscore the historical significance of each guitarist. Finally, the authentic matching audio with backing tracks will facilitate the acquisition of your own powers of improvisation. Through studying and assimilating the vocabulary and the work of the masters, you will be on your way to finding and developing your own voice and saying with it what cannot be expressed with words -- the goal of improvising musicians everywhere.